October 4, 1970 – Janis Lyn Joplin was truly one of the most remarkable rock and blues performers of the 1960s and the decades following. Born in Port Arthur Texas, on January 19, 1943, she escaped the small town prejudices and took off for the San Francisco counter culture, dominated by Love and Peace and Alcohol and Drugs. Janis unfortunately became a member of the infamous forever 27 Club as she passed on October 4, 1970, just a short 3 weeks after her brief former love interest and famous 27 Club member Jimi Hendrix. She was no. 4 to join the club after Robert Johnson, Brian Jones and Jimi Hendrix. Her Texas upbringing put Joplin under the sway of Leadbelly, Bessie Smith and Big Mama Thornton in her teens, and the authenticity of these voices strongly influenced her decision to become a singer. A self-described “misfit” in high school, she suffered virtual ostracism, but dabbled in folk music with her friends and painted. She briefly attended college in Beaumont and Austin but was more drawn to blues legends and beat poetry than her studies; soon she dropped out and, in 1963, headed for San Francisco, eventually finding herself in the hippie filled Haight Ashbury neighborhood. She met up with guitarist Jorma Kaukonen (later of the legendary San Francisco rock outfit Jefferson Airplane) and the pair recorded a suite of songs with Jorma’s wife, Margareta, providing the beat on her typewriter. These tracks – including blues standards like “Trouble in Mind” and “Nobody Knows You When You’re Down and Out” – would later surface as the infamous “Typewriter Tapes” bootleg. Joplin assembled a new backup group, the Full Tilt Boogie Band, in 1970; she also joined the Grateful Dead, the Band and other artists for the “Festival Express” railroad tour through Canada. Her musical evolution followed the earthier, rootsier direction of the new decade, as reflected in her final studio album, the landmark Pearl. Embracing material such as Kris Kristofferson’s gorgeous country ballad “Me and Bobby McGee” and her own a cappella plaint, “Mercedes Benz,” the disc showcased Joplin’s mastery of virtually all pop genres. The latter song was, along with a phone-message birthday greeting for John Lennon, the last thing she recorded; she died on October 4 of 1970, and Pearl was released posthumously the following year. The quadruple-platinum set became the top-selling release of Joplin’s career and, in 2003, was ranked #122 on Rolling Stone’s “500 Greatest Albums of All Time” and the Kris Kristofferson written Me and Bobby McGee her most memorable song ever. In the years since, Janis Joplin’s recordings and filmed performances have cemented her status as an icon, inspiring countless imitators and musical devotees. Myriad hit collections, live anthologies and other repackaged releases have kept her legend alive, as have one-woman shows such as the hit Love, Janis (which Joplin’s sister, Laura, helped create) and 2009’s Edinburgh Festival Fringe “Best Solo Performance” nominee Janis. A documentary film, produced by Jeff Jampol in tandem with Spitfire Films, is currently in development. In 1988, the Janis Joplin Memorial, featuring a bronze sculpture by artist Douglas Clark, was unveiled in Port Arthur. 1. Before she became famous, Janis once walked up to Bob Dylan and told him she was going to be famous one day. 2. She wasn’t afraid to admit that she liked to be around men. During an interview, Howard Smith (The Smith Tapes) asked her why she didn’t have women in any of her groups. 3. She demanded to be different, growing up. “She was pushing the limits and women weren’t supposed to swear, and women were supposed to be demure and not know that anything existed below their waistlines,” said Dave Moriaty, one of Joplin’s childhood friends. 4. She never had formal vocal training. Janis’ parents had wanted her to be a school teacher. But she started singing when she was 17 and never turned back. She was completely self-taught, learning from listening to many great musicians. 5. She was free about her sexuality, dating both women and men. “I don’t think she was with girls to shock people. I think she was with girls because that’s what she felt at the moment,” said Jae Whittaker, Janis’ former girlfriend. 6. The main inspiration for her singing style was Otis Redding. 7. She once airlifted a friend into Woodstock. When Janis learned that her friend and sometimes lover Peggy Caserta was stuck in traffic and wouldn’t be able to make it to Woodstock, where Janis was performing, she sent a helicopter to fetch her friend. 8. Her talents brought Kris Kristofferson to tears. Kris Kristofferson didn’t get to hear Janis’ rendition of “Me and Bobby McGee” — a song that he wrote — until after her death. “I didn’t hear [it] until she was gone. And it was very emotional for me. I could just see her saying, ‘wait till that son of a b***h hears this,’ you know?” said Kris Kristofferson. 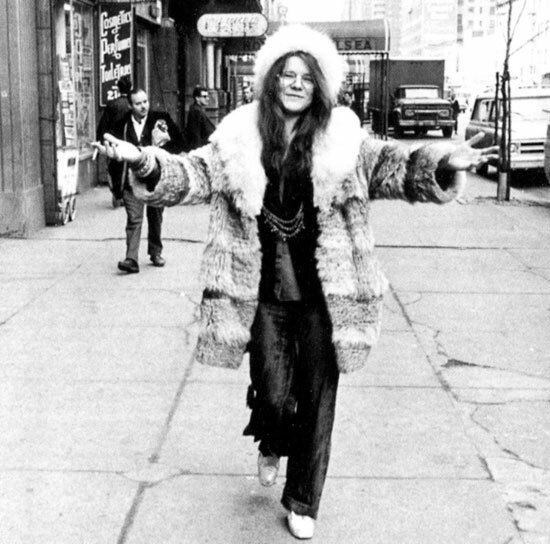 Janis’ “Me and Bobby McGee” became the number one single in the U.S. in 1971. 9. She was unapologetic about defying gender roles at the time. 10. She put her friends’ happiness above all else.